IF YOU MUST BLINK….DO IT NOW! While Disney, Pixar, DreamWorks, and Illumination Entertainment jostled for position as the “dominating powerhouse” of animation features, Laika Entertainment, a stop-motion animation company has been producing cartoon films and building a steady reputation for the quality and care of their movie’s presentation, including features like ParaNorman, The Boxtrolls, and Coraline. While other animated companies find their usually groove in traditional styles for the genre, Laika’s films are more advanced, offering more artistic invention and bringing a more mature themes / sophisticated messages to the proceedings. 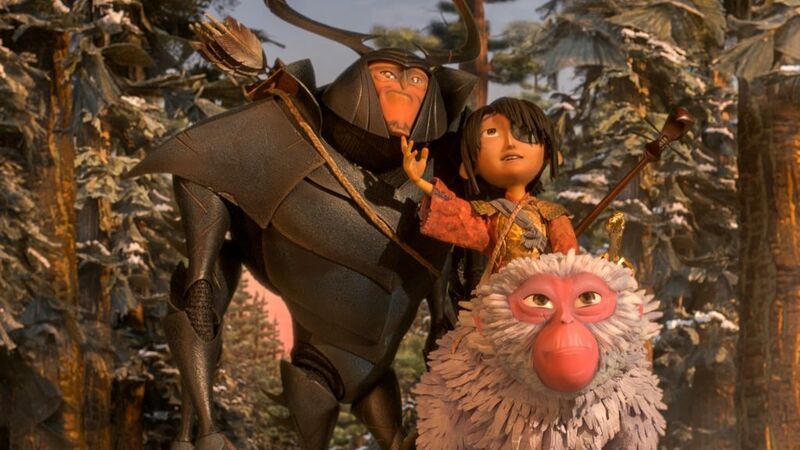 Now, Laika Entertainment, Focus Features, and director Travis Knight bring the newest animated film to life with the movie Kubo and the Two Strings. Does this latest animation feature enchant its viewers or is it a dull picture with bland cartoon razzmatazz? Kubo (Art Parkinson) is a young boy who had one eye stolen by his grandfather, with his Mother escaping out of the magical kingdom to raise her son in solitude. Armed with a magical guitar (a shamisen), Kubo performs and dazzles a nearby village with his stories of danger and heroism, performed by enchanted origami paper, sharing tales that were once told to him by his mother as he grew up. Forsaken his mother words of not to tread outside their cave after dark, Kubo loose his protection, incurring the wrath of his Mother’s evil sisters (both played Rooney Mara) and forced to flee using the last of his mother’s magic. Now accompanied by Monkey (Charlize Theron), Kubo’s wooden charm brought to real life, and soon joined by Beetle (Matthew McConaughey), a samurai / insect beetle hybrid, Kubo learns of a magical quest he must complete, gathering the pieces of a mystical armor to help defend the land against the Sisters and the Moon King (Ralph Fiennes), who wants to possess the boy’s other eye. Yes, I am a big fan animated movies, so I’ve seeing plenty of Disney, Pixar, and DreamWorks, with some being awesomely stellar to some that are downright deplorable. As for Laika’s film (if I’m being honest), I’ve only seeing Coraline (from start to finish) and with a few scenes here and there from The Boxtrolls and ParaNorman (although I have good things from those two movies. So I might have to check them out). Personally, I’ve always supported stop-motion animation films as (like 2D hand drawing animations) is becoming a bit obsolete in comparison to today’s style of computer 3D animation. Which brings me to the point of this post with Laika’s newest film Kubo and the Two Strings. There’s been several trailers for this movie (I think five in total), which is why I didn’t post them on my site because it would’ve been too much. However, each trailer I’ve seeing for this movie have been pretty cool and peeked my interest in seeing this movie. What did I think of it? Well, I actually loved it, for Kubo and the Two Strings was great animated movie with artistic beauty and a classic hero’s journey. Interestingly enough, Kubo and the Two Strings is directed by Travis Knight, who makes his directorial debut with this feature. Knight, who has played a key role in Laika studios as lead animator and having a seat on the board of directors, knows the ins and outs of making one of their films, so it’s a perfect fit to make his first feature film debut with a movie like Kubo. With an animation background, Knight paints a very beautiful world within the movie, setting the feature in a feudalistic japan with a mixture of Japanese folklore mysticism. As I said above, I’ve always appreciated animated films with their unique animation styles as Kubo continues Laika’s tradition of using stop-motion animation for their films. In fact, Kubo is probably the best movie of Laika (visually speaking), utilizing top notch animation that looks superb (almost didn’t believe it was stop-motion animation) with a bright palette of colorful imagery. Even harder tricks of animation (i.e. flying, underwater scenes, and lengthy action sequences) are rendered beautifully and with a slick and fluid presentation. Additionally, the film’s character designs are creative and very detailed, making Kubo Laika’s most expressive characters to date, mixing a layer facial features that can be both subtle and expressive in each passing scene. Personally, my favorite character design for the movie are The Sisters (they look awesome!). The film’s narrative is also a classic one, following the stereotypical Hero’s journey. While it’s a commonplace narrative structure, it’s an entertaining one as Knight keeps the feature engaging with action and visuals on-screen. 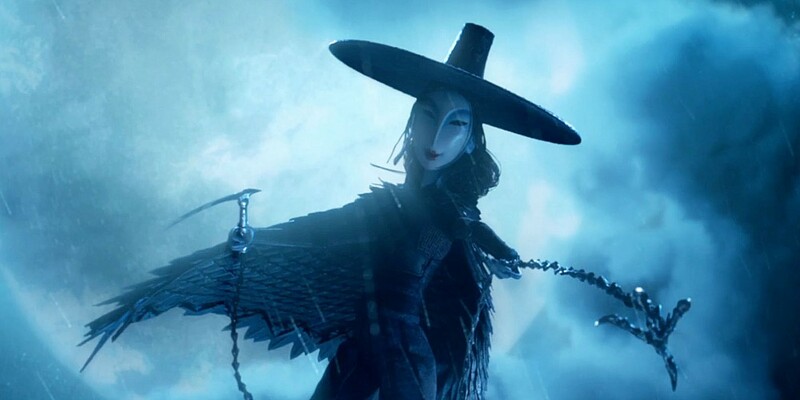 In comparison to other animated movies out there, Kubo and the Two Strings is also a tad bit dark with some scary images as well as a thematic message of finding courage from death and loss. As I said, Laika’s movies are more geared towards older kids (9 or 10), so kids younger than that might get a bit scared with Kubo and the Two Strings. Also, before I forget, the film’s score that was composed by Dario Marianelli is pretty good as well. If I had to criticize the movie, I would say that there are several nitpicks I have with it. First, with the film following the straightforward narrative of a hero’s journey, several of the twist / big reveal moments are easy to spot, which diluted it a bit. Next, there are handful of scenes (especially in the beginning) that are not fully explained and are simply glossed over. There could’ve been a bit more time into describing these particular scenes to help better understand the event or to the overall story. Finally, the film does run a bit long and does have one or two points were there’s a lull in the storytelling, causing the movie to have a pace problem at those points. Bringing these colorful characters to life is a group of talented actors / actresses that do solid work in their voice acting. Game of Thrones alum Art Parkinson (Rickon Stark) voices Kubo, the film’s central hero. Parkinson has a calm sounding voice that’s sort of endearing to hear as his character goes on his supernatural journey and overcomes loss and the discovery of his fantastical lineage. The character isn’t that complex, but is a representation of a classic youthful individual that undergoes a journey, which can be a bit formulaic at time, but Kubo is still a good protagonist for the feature of magic and origami mysticism. Aiding the hero Kubo on his journey is Monkey and Beetle, voiced by Charlize Theron and Matthew McConaughey respectfully. Both characters bring humor and exposition to the feature (and to the viewers) as both Theron and McConaughey are excellent and quite memorable in their supporting heroes roles. Additionally, they both have great cheeky banter with each other (and with Kubo) and become that more entertaining throughout the movie. As for the film’s antagonist, actress Rooney Mara voice Kubo’s mother’s sisters (dubbed as The Sisters) and actor Ralph Fiennes as the Moon King, Kubo’s grandfather. These characters are not as complex evildoer, but, given how the story is presented as the atypical hero’s journey, they get the job done in serving their purpose in the way of villainy (especially The Sisters). Lastly, in a very smaller cameo-like role, is George Takei, voicing the village character Hosato. Awesome….can’t wait to read you review! Tbh this movie looks soooo weird, hahaha! Might have to check it out though, great review!! Thank you! It may look a bit weird, but its pretty much a classic hero’s journey film. Like I said in my review, the animation is gorgeous. It’s nice to see a mainstream animated film not produced by Pixar, Dreamworks, Blue Sky, Illumination etc. It’s definitely a film I want to watch. Great review, by the way. Oh yeah, I agree. Its kind of cool to see another animation studio get their due in the spotlight. Oh yeah. It was great. The voice was also solid. Thought the film was ok, and I like the review. So why isn’t there a frikkin “Like” button!? Ummm….there is a like button (so far I have 7 likes for this review). But thank you for commenting! Whoops. Sorry, still new to this.